We are now able to offer this exciting new range of Sun Gongs, hand tuned to the planetary frequencies as established by Hans Cousto who wrote "The Cosmic Octave". 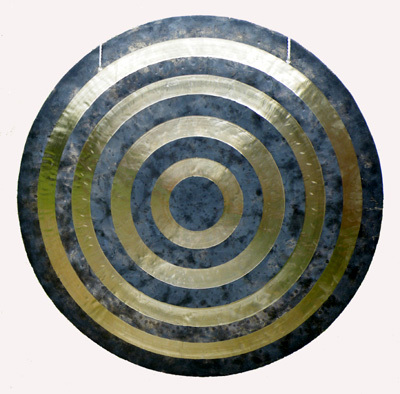 These distinctive quality bronze Sun Gongs are hand made in Wuhan, China. The bronze is an alloy of 77% copper and 23% tin and is virgin material, not recycled bronze as used in some cheaper inferior gongs on the market! They are slightly convex with no rim, the gong is polished all over except for the distinctive concentric rings. Sun Gongs give you a distinct gong sound that is responsive enough to produce rich overtones with an enormously wide range of volume.The sound is very grounding, at the same time melodic and complex with an organic quality, making these gongs very popular with sound therapists. To further describe the sound one could say that these beautiful gongs have a unique complex sound which is somewhere between a Chao and a Wind Gong. Very special and excellent value! Available from stock in 5 sizes.